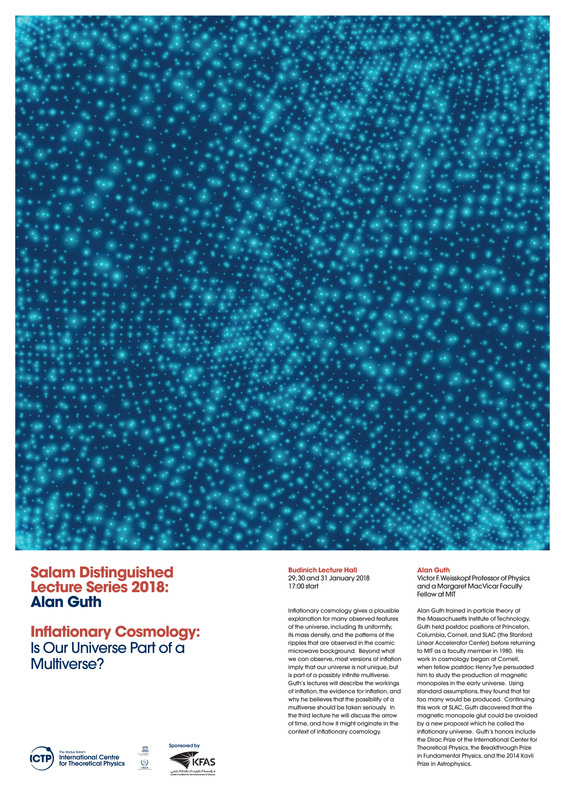 Salam Distinguished Lectures 2018: Inflationary Cosmology: Is Our Universe Part of a Multiverse? ICTP's Salam Distinguished Lecture Series is an annual presentation of talks by renowned, active scientists. The aim is to showcase important research developments as well as provide a visionary forward view. The lecture series is supported by the Kuwait Programme at ICTP. Alan Guth is the Victor F. Weisskopf Professor of Physics and a Margaret MacVicar Faculty Fellow at the Massachusetts Institute of Technology. Trained in particle theory at MIT, Guth held postdoc positions at Princeton, Columbia, Cornell, and SLAC (the Stanford Linear Accelerator Center) before returning to MIT as a faculty member in 1980. His work in cosmology began at Cornell, when fellow postdoc Henry Tye persuaded him to study the production of magnetic monopoles in the early universe. Using standard assumptions, they found that far too many would be produced. Continuing this work at SLAC, Guth discovered that the magnetic monopole glut could be avoided by a new proposal which he called the inflationary universe. Guth's honors include ICTP's Dirac Prize, the Breakthrough Prize in Fundamental Physics, and the 2014 Kavli Prize in Astrophysics. Guth is still busy exploring the consequences of inflation. He has also written a popular-level book called "The Inflationary Universe: The Quest for a New Theory of Cosmic Origins" (Addison-Wesley/Perseus Books, 1997). There will be 3 lectures, on 29, 30 and 31 January 2018, start time: 17.00 hrs. Lecture I: "Inflationary Cosmology: Is Our Universe Part of a Multiverse?" Abstract: Inflationary cosmology gives a plausible explanation for many observed features of the universe, including its uniformity, its mass density, and the patterns of the ripples that are observed in the cosmic microwave background. Beyond what we can observe, most versions of inflation imply that our universe is not unique, but is part of a possibly infinite multiverse. I will describe the workings of inflation, the evidence for inflation, and why I believe that the possibility of a multiverse should be taken seriously. Lecture II: "Eternal Inflation and its Implications" Abstract: This lecture will further explore the connection between inflation and the multiverse. I will describe the mechanism of inflation in more detail, showing why most versions lead to eternal inflation: once inflation starts, it never completely stops, but instead the inflating region grows forever, producing "pocket universes" ad infinitum. Eternal inflation is in some ways very attractive, because, for example, it offers a possible explanation for why the energy density of the vacuum is so incredibly small. But it also leads to the "measure problem": how does one define probabilities in an infinite system in which any allowed event is expected to occur an infinite number of times? Lecture III: "Infinite Phase Space and the Two-Headed Arrow of Time" Abstract: One of the unsolved mysteries of physics is the arrow of time: the laws of physics make no distinction between the future and the past, but in our experience they are entirely different. The arrow of time can be identified with the growth of entropy, but what caused the entropy to be lower in the past? I will describe a speculative picture which shows how an arrow of time can develop naturally, provided that the available phase space is infinite, even in a system with time-reversible laws of physics, and with no special initial conditions. I will also discuss the alternative possibility that the phase space available to the universe is finite, arguing that this assumption leads to serious cosmological problems.